Would You Resell Your Ebooks and MP3s Even If You Could? 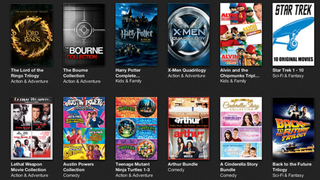 The MPAA doesn't want you to resell the movies you buy on iTunes and other services. The U.S. House of Representatives' Committee on the Judiciary's Subcommittee Intellectual Properly and the Internet hearing is now discussing if they are right or wrong in a—but does it matter? Would you resell your digital goods online if you could? "Forcing creators to allow resale of Internet content they license would either require creators to substantially raise prices or discourage them from offering flexible, Internet-based models in the first place," says the MPAA's Neil Fried in a statement on the website. Most consumers, who spend hundreds of dollars on movies, music, TV shows and books from iTunes, Google Play and Amazon might not think it's too different than buying something from the nearest Best Buy. But digital content doesn't really work that way. All you're buying, in most cases, is a license that allows you to access a particular piece of content. When you buy a Kindle ebook, for instance, Amazon's terms of service grant you "a non-exclusive right to view, use, and display such Kindle Content an unlimited number of times." In other words, you own nothing.